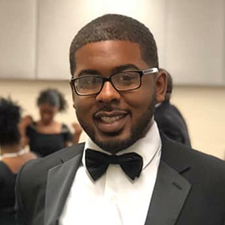 Whether he was documenting the action by photographing events for the Thorobred News or in the spotlight with the concert choir, gospel ensemble and small vocal ensemble, Kentucky State University graduating senior Rashad Bishop stayed involved. The Louisville senior is graduating Dec. 14 with a major in liberal studies. Bishop participated in many organizations on campus throughout his academic career. In 2014, he was the freshman class treasurer in the Student Government Association (SGA). He’s also served on the Thorobred News, Street Scholarz and in various musical groups on campus. “The obstacle that I overcame was I continued to work hard no matter how difficult it seemed,” Bishop said. He’s been able to continue to work hard through his faith in God, Bishop said. Bishop chose Kentucky State University because he wanted something different, he said. Bishop said his career plans after graduation include a media position at UPS. Bishop is one of many scheduled to graduate Friday, Dec. 14 from Kentucky State University. For more information about commencement, click here.